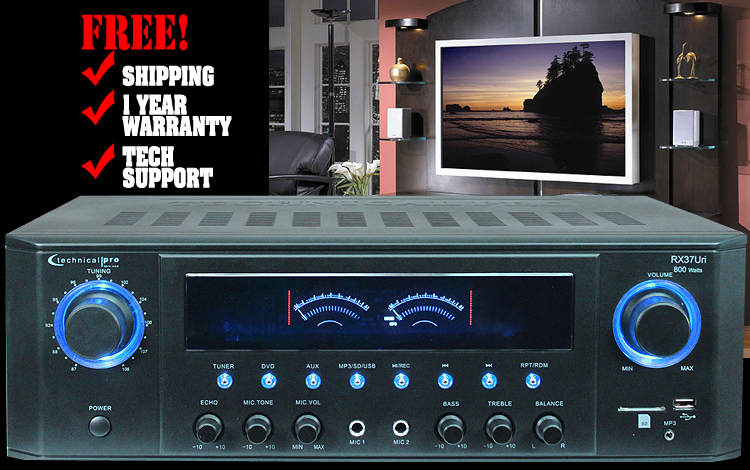 The RX37 professional receiver has everything you need for today’s current demands. Aligned with all of the products from Technical Pro, this unit is built to last and guaranteed to provide a high level of performance and crystal clear sound! Do you need to play a CD, a DVD, an or MP3 Player? Do you need to connect two microphones or play an MP3 file from a USB flash drive or SD Card? Do you need an FM tuner to reference or play FM radio? In today’s audio environment it’s important to be able to connect multiple, varying sources to your audio system and the RX37 can handle it all! The RX37 back panel inputs consist of two stereo RCA inputs for two different audio sources. The front panel inputs are exactly where they should be, on the front panel! This will allow you to easily connect and disconnect an MP3 player, SD Card, USB flash drive and two microphones. These sources are usually switched in and out on a daily basis depending on your needs. Thinking ahead, Technical Pro designed this unit with ease in mind. Do you really want to go to the back panel of a rack to connect an MP3 player? Neither do we! So what is so special about a USB flash drive / SD Card input? Like most of us, you probably have an ever-growing library of mp3 audio files on your computer or laptop that you want to listen to while sitting on the comfort of your couch. Have you ever tripped over a wire connected to your computer or laptop and then dive onto the floor to save it from crashing and breaking into pieces? We can all agree the fewer wires in our sound system the better. A USB flash drive / SD Card lets you carry around thousands of .mp3 audio files in the palm of your hand. Simply connect the USB flash drive / SD Card to the computer and copy the.mp3 files onto the USB flash drive / SD Card. Disconnect it from the computer and connect it to the RX37 and the unit will automatically begin playing the files from the USB flash drive / SD Card. All while keeping your laptop perfectly safe.